Girders are generally needed only in the first floor, since in all the other floors the inner ends of the joists may be supported by the partitions of the floor below. They are usually of wood, though it may sometimes be found economical to use steel beams in large buildings, and even in small buildings the use of steel for this purpose is increasing rapidly. Wrought iron was once used, but steel is now cheaper and has taken its place. However, when this is not found to be expedient, hard pine or spruce girders will answer very well. The connections used in the case of steel girders will be explained later. The girders may be of spruce or even of hemlock, but it is hard to get the hemlock in such large sizes as would be required, and spruce, too, is hardly strong enough for the purpose. Southern pine, therefore, is usually employed for girders in the best work. The size of the girder depends on the span, that is, the distance between the supporting walls, and upon the loads which the floor is expected to carry. In general, the size of a beam or girder varies directly as the square of the length of the span, so that if we have two spans, one of which is twice as great as the other, the girder for the longer span should be four times as strong as the girder for the smaller span. In ordinary houses, however, all the girders are made about 8X12 inches in sections, although sometimes an 8 X 8-inch timber would suffice, and sometimes perhaps a 12-inch piece would be required. It should be remembered in deciding upon the size of this piece, that any girder is increased in strength in direct proportion to the width of the timber (that is, a girder 12 inches wide is twice as strong as one 6 inches wide), but in direct proportion also to the square of the depth (that is, a girder 12 inches deep is four times as strong as one 6 inches deep). Hence, the most economical girder is one which is deeper than it is wide, such as an 8X 12-inch stick; and the width may be decreased by any amount so long as it is wide enough to provide sufficient stiffness, and the depth is sufficient to enable the piece to carry the load placed upon it. If the piece is made too narrow in proportion to its depth, however, it is likely to fail by "buckling," that is, it will bend as shown in Fig. 132. It has been found by experience that for safety the width should be at least equal to 1/6 of the depth. Fig. 132. Buckled Girder Showing Too Light Construction. Fig. 133. Double Stirrup Joist Supporter. Fig. 134. Single Joist Hanger. There are at least three ways in which the joists may be supported by a girder. The best, but most expensive, method is to support the ends of the joists in patent hangers or stirrup irons which connect with the girder. 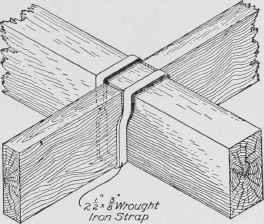 This method is the same as was described for the sill, except that with the girder a double stirrup iron, such as that shown in Fig. 133, may be used. These stirrup iron hangers are made of wrought iron, 2 1/2 or 3 inches wide, and about 3/8 inch thick, bent into the required shape. They usually fail by the crushing of the wood of the girders, especially when a single hanger, like that shown in Fig. 134, is used. Fig. 135 shows a double stirrup iron hanger in use. 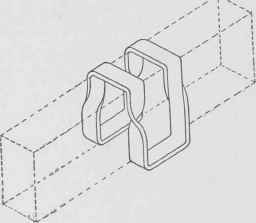 Patent hangers as shown in Fig. 13G are the most suitable. 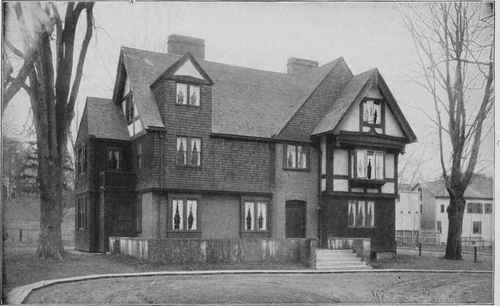 HOUSE FOR MR. C. M. THOMPSON, CAMBRIDGE, MASS. The Seven General Contract Estimates Ran from $18,715 down to $11,769. The House was Built at the Latter Figure, plus a Great Many Extras Added by the Owner; and to this Amount was Added $2,000 for Plumbing and Heating. It was Built in 1900. The House Faces about South. 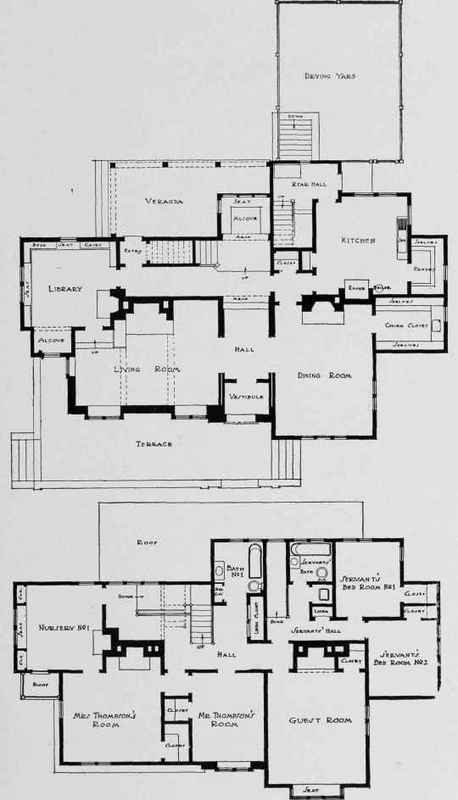 FIRST AND SECOND STORY PLANS OF HOUSE FOR MR. C. M. THOMPSON, CAMBRIDGE, MASS. Cram, Goodhue & Ferguson, Architects, Boston and New York. 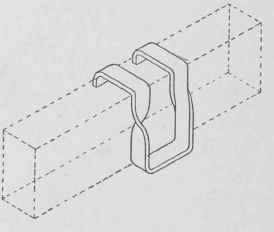 If hangers of any kind are used, there will be no cutting of the girder except at the ends, where it frames into the sill, and even there a hanger may be used. The girder may be placed so that the joists will be flush with it on top, or so that it is flush with the sill on top. Fig. 135. Double Hanger with Joists in Place. Fig. 136. Patent Hanger with Joists in Place. Fig. 137. Joists Framed into Sill. 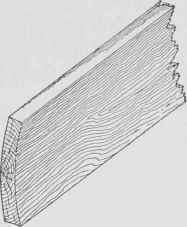 If the joists are flush with the girder on top, and are framed into the sill in the ordinary way, as shown in Fig. 137, the girder can not be flush on top with the sill; while, on the other hand, if the girder is flush with the sill on top, it can not at the same time be flush with the joists on top. 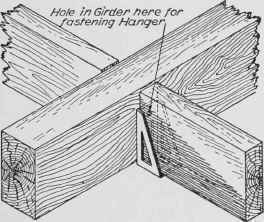 If joist hangers are used on the girder to support the joists, they will probably be used on the sill as well, as explained in connection with the sill; and in this case the girder can be made flush with the sill on top and the joists hung from both girder and sill with hangers, thus bringing both ends of a joist to the same level, as shown in Fig. 138. If the girder were framed into the sill at all, it would almost always be made flush with the sill on top, and by the proper adjustment of the hangers the joists would be arranged so as to be level. Fig. 138. Method of Bringing Joist Level When Resting on Sill. 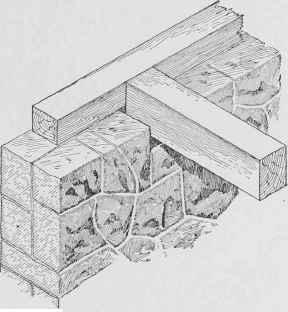 For framing the girder into the sill, a tenon-and-tusk joint, as shown in Fig. 139, would be used if the girder is to be flush with the sill on top. Since the girder would in most cases be deeper than the sill, the latter having a depth of only 6 inches the wall would necessarily have to be cut away in order to make a place for the girder. This condition is clearly shown in Fig. 140. The girder itself should not be cut over the wall, as shown in Fig. 141, because this greatly weakens the girder. 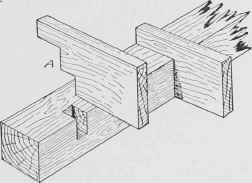 If this method is used, the joists should be framed into the girder in the same way as they are framed into the sill, a mortise being cut in the girder, and a tenon on the joist. This is called "gaining" and is shown in Fig. 137. The top of the girder thus comes several inches below the top of the floor. Another method is to make the top of the girder flush with the top of the joists. 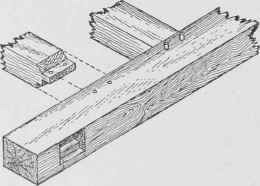 The joists are then framed into the girder with a tenon-and-tusk joint, as shown in Fig. 139, and the girder is "gained" into the sill, as shown in Fig. 137. Fig. 139. 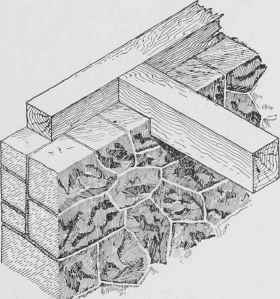 Tenon-and-Tusk Joint between Sill and Girder. Still another method in common use is simply to "size down" the joists on the girder about 1 inch, as shown in Fig. 142. In this case, of course, the girder is much lower than the sill, usually so low that it can not be framed into the sill at all, but must be supported by the walls independently. Holes are left in the wall where the girders come, the latter being run into the holes, and their ends resting directly on the wall, independent of the sill. This is not very good construction, however, because the floor is not tied together as it is when the girder frames into the sill. The first method is the best and is the one in most common use. The girders serve to support the partitions as well as to support the floors, and should, therefore, be designed to come under the partitions whenever this is possible. When the distance between the outside walls is too great to be spanned by the girder, it is supported on brick piers or posts of hard wood or cast iron in the cellar. Such piers or posts should always be placed wherever girders running in different directions intersect. Girders are also often supported on brick cellar partitions. Fig. 140. Wall Cut Away to Allow Girder and Sill to Join at Same Level. Fig. 141. Cutting Girder Bad Practice on Account of Weakening Effect.